This spectacular two day tour takes you along the Lake Superior shoreline then inland through the heart of Algoma. Highlights include the scenery between Sault Ste. Marie and Wawa, the insanely twisty highway 129, and the tranquil island roads of St. Joseph's Island. Wake up in the Soo (as it's called locally) at one of the many rider friendly accommodators. You have all day to travel the 145 miles/234 km to Wawa and there are a lot of sights to see, so take your time to enjoy it. After breakfast ride down to the river-front and check out the Sault Canal National Historic Site and the Canadian Bushplane Heritage Centre, both are very welcoming to riders. After learning about the region's air and marine history, head up to Highway 17 and begin your ride north to Wawa. Your first stop will be at Agawa Indian Crafts and The Canadian Carver where you will find all kinds of souvenirs. If your bike is thirsty it might not be a bad idea to top it up and you will have no issues getting to Wawa. If you're hungry, check out the impressive snitzel and breathtaking views of Lake Superior at the Salzburger Hof Restaurant in Batchawana Bay. Next stop is Alona Bay. Pull off and take in a great view of the Lake Superior. 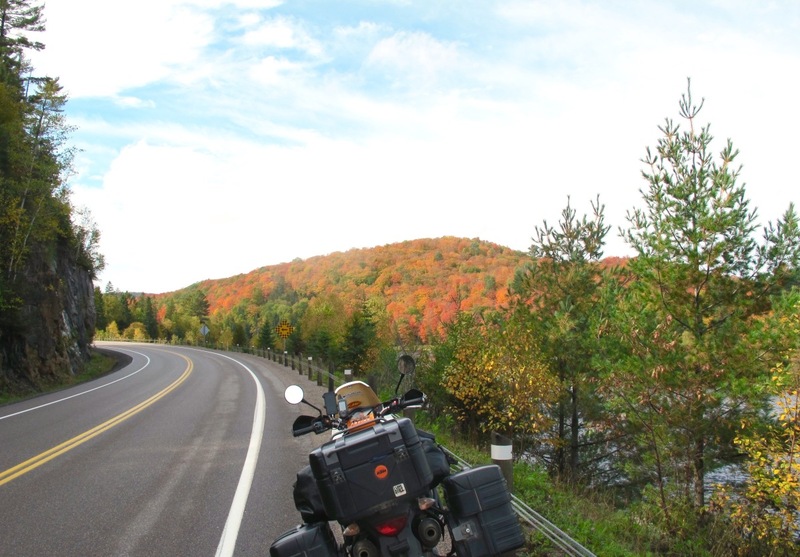 Keep heading north to the Agawa Bay Visitor Centre, operated by the bike friendly folks at Lake Superior Provincial Park. Here there is easy access to the shore of the lake and a great visitor center that explains the significance of Lake Superior and the surrounding region. The visitor center staff can direct you to any other must stops between here and Wawa. Heading into Wawa you will see the entrance for Magpie High Falls. This is an incredible waterfall but does have approximately 4 km of gravel roads to get there. If you and your bike can handle it, it's well worth the trip. Other must stops in Wawa are the Wawa Goose and Young's General Store. You can check into your accommodations first then explore or do it now before you park. Depending where you are staying, there are several rider friendly options for dinner in Wawa. 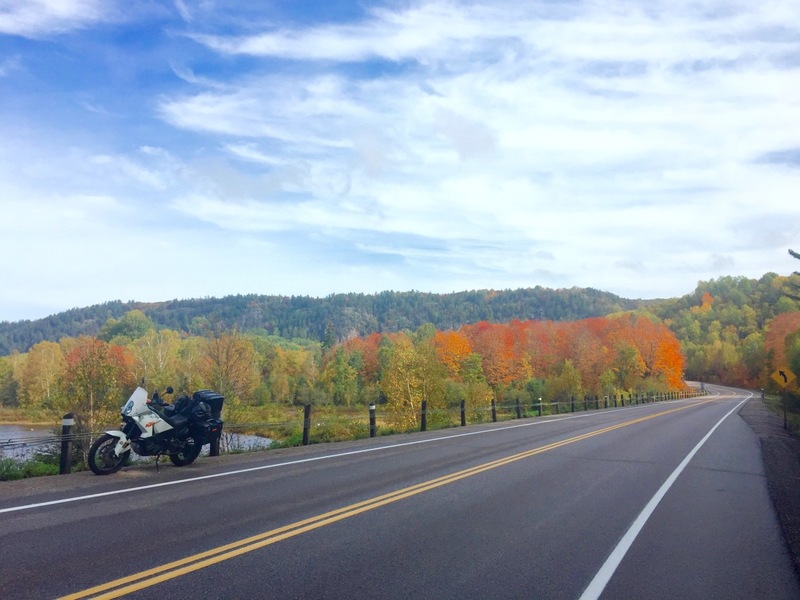 Lots of highlights this day as you pass through varied terrain and river valleys and one of the twistiest roads in Algoma. You will ride through Chapleau, which is the largest game preserve in the Northern Hemisphere and you will also straddle the line where all water starts to flow north into the Arctic Watershed. Heading south on Hwy 129 it's just you, the bush and the occasional bear or deer. Be sure to stop at Aubrey Falls Provincial Park. From here the road just keeps getting better as you follow tightly to the Mississagi River. They are continuing to upgrade this stretch of road so it keeps getting better. Follow 129 all the way down to the Trans Canada (Hwy 17) to Thessalon, a great little town that's worth a stop. If you came from South Eastern Ontario/Quebec you will head East on Hwy 17 and can explore Elliot Lake's Deer Trail on your way home. Or if you are from the US, head right or East back to Sault Ste. Marie. Be sure to stop at the Bruce Mines Museum. This roadside museum has an incredible collection that tells a cool story of life in the north. If you want to extend your ride drop down onto St. Joseph Island and spend the night in Hilton Beach. Riding on the Island is super fun as there is no traffic and lots of interesting stops. Continuing on to Sault Ste. Marie, rip into Echo Bay and get your picture taken with the Big Loonie. The Big Loonie is a nickname for the Canadian $1 dollar coin. Head back into the city, be sure to make time check out any of the attractions you missed when you left. Sault Ste. Marie to Wawa- Be sure to gas up in Sault Ste. Marie before departure as its 145 miles, 234km to Wawa. Wawa to Sault Ste. Marie- After refueling in Wawa you will also want to refuel in Chapleau to ensure enough gas to Thessalon. Wawa to Sault Ste. Marie- 101 East to 129 South all the way down to the Trans-Canada Highway at Thessalon.